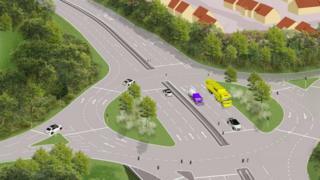 A six-lane road through a "bottleneck" roundabout on Bristol Ring Road is being planned by councillors. Transport chiefs said the project for the Wraxall Road junction would cost £6.9m and have approved £1.5m to develop the scheme. The West of England Combined Authority (Weca), which will pay for the project, said it hoped the project would cut congestion and accidents. Residents and drivers are now being asked for their views on the plans. Traffic lights would also be introduced at the junction in Kingswood, which is currently the only junction on the ring road without lights. The Local Democracy Reporting Service said the approach roads would be widened to make room for three lanes in both directions for vehicles on the ring road going straight ahead. South Gloucestershire Council's consultation document says: "Drivers on each approach will be given priority to enter the roundabout, with the timing of traffic signal phases responding to changes in the use of the junction throughout the day." Council leader Toby Savage told Weca committee members: "The A4174 Wraxall Road roundabout is a significant bottleneck and has been a source of complaints for a number of years." The council's consultation paper adds: "The roundabout currently experiences congestion during the busiest hours on weekdays, with queuing on the ring road as well as Tower Lane and Wraxall Road approaches to the roundabout. This includes local bus services." A report to last week's Weca committee said that, on top of the £200,000 cost of the feasibility study and the now-approved £1.5m to produce a full business case, implementing the scheme would require nearly another £5.2m.